Voters wait in line at a polling place inside Life.Church in Edmond Tuesday. Journal Record editor Ted Streuli speak with KGOU's Jacob McCleland. Former Edmond Mayor Dan O’Neill gathered 700 signatures to bring the zoning change to the ballot. 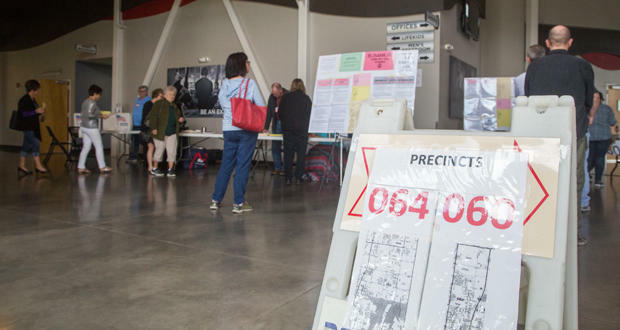 Voters sided against the development, 65 to 35 percent. “Opponents said they didn’t want the traffic that they thought the apartments would bring. They also said they thought the building height would detract from Hafer Park,” Streuli said. Supporters of the expansion included city hall, the Chamber of Commerce and the Edmond Economic Development Authority. They said the new space would have attracted new restaurants and retail areas to the city, and added to Edmond’s apartment stock. “It would have added a lot to the sales tax base for the city, which is all the revenue the city has to survive on. It would have also added property taxes, which benefit the schools,” Streuli said. Jacob McCleland: Ted, what would this expansion in Edmond have been if voters had approved it? Ted Streuli: This would have been about a 26-acre mixed-use development that would have connected the Spring Creek Plaza shopping center to the south side of Hafer Park. It would have been with a four-story complex that would have had retail on the ground floor with 325 apartments on the three upper floors. McCleland: The final vote tally on this really wasn’t even that close. Why were Edmond voters so against this? Streuli: Well, no, it wasn’t close at all. It went down about 2-to-1 against. Opponents were very active in their campaign. Opponents said they didn’t want the traffic that they thought the apartments would bring. They also said they thought the building height would detract from Hafer Park. McCleland: By voting against the expansion, residents were undoing action by the Edmond city council. Who was in charge of the campaign against it? Streuli: Well, it was former Edmond Mayor Dan O’Neil who really led that petition drive, with some help obviously. He’s the same guy who led the drive last year to ban LED billboards in Edmond. McCleland: Who were the players in favor of the expansion? Streuli: Well it was City Hall, the Chamber of Commerce and the Edmond Economic Development Authority at the forefront in favor of this because it would have added a lot to the sales tax base for the city, which is all the revenue the city has to survive on. It would have also added property taxes, which benefit the schools. The space itself would have brought some desirable restaurants and retail areas to the city, and of course the apartments, which Edmond doesn’t have a lot of. McCleland: By rejecting this, does Edmond run the risk of endangering future expansion or other investments by looking like a hostile place for development? Streuli: That’s certainly the opinion of the Chamber of Commerce and the Economic Development Authority. This project had been in the works for three years, and they contend the developers will be reluctant to spend that kind of time and money on a proposal if they know they’re likely to get enormous push-back from the residents. McCleland: Let’s shift our focus for just a moment to talk a little about the effort to curb the state’s feral hog population. First, from a business perspective, why are feral hogs bad for Oklahoma? How much damage can these things cause? Streuli: They do millions of dollars of damage to property in Oklahoma and $1.5 billion per year nationally. Swine are not native to Oklahoma, but have been seen in all 77 counties. Last year the Agriculture Department reported that 11,200 feral hogs were destroyed here. They do an enormous amount of damage. McCleland: Reporter Brian Brus writes in an article in the Journal Record that the state Department of Agriculture hasn’t seen in increase in its budget to fund feral hog eradication efforts. But they have found a way to reduce the number of the invasive species. What it is? Streuli: Well, they’re handing out traps. The state veterinarian said it’s a very effective way to deal with this. The department’s going to provide traps to all 85 conservation districts in the state as well as money to buy the supplies that go along with those. McCleland: Some feral animals, like city cats, are often caught, sterilized, and then re-released. Why not for feral hogs? Streuli: The sterile cats are released so they can deter successful breeding. But sterile or not, the hogs just cause too much damage to turn them loose again. McCleland: There is a bill in the legislature that would allow people to shoot feral hogs from helicopters. How exactly would this measure work? Streuli: As it is now, only contractors through the Agriculture Department are allowed to do that. If this bill, it’s House Bill 2324, it that passes, then landowners with their own aircraft would be able to arrange their own aerial hunts.